For the Oxford University student magazine, see Isis magazine. For other uses, see Isis (disambiguation). Punting on the Isis at Oxford. Map of Oxford c. 1900, with the river labelled as "River Thames or Isis". Rowing on the Isis opposite the Oxford college boathouses. 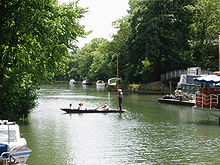 "The Isis" is an alternative name for the River Thames, used from its source in the Cotswolds until it is joined by the Thame at Dorchester in Oxfordshire. It derives from the ancient name for the Thames, Tamesis, which in the Middle Ages was falsely assumed to be a combination of "Thame" and "Isis". [note 1] Notably, the Isis flows through the city of Oxford. The name "Isis" is especially used in the context of rowing at the University of Oxford. A number of rowing regattas are held on the Isis, including Eights Week, the most important Oxford University regatta, in the Trinity term (summer), Torpids in the Hilary term (early spring) and Christ Church Regatta for novices in the Michaelmas term (autumn). Because the width of the river is restricted at Oxford, rowing eights normally have a staggered start near Donnington Bridge and must then aim to "bump" the eight in front (i.e. catch up and touch or overlap with it sufficiently). The leading eight aims to "row over" (i.e. finish the race without being bumped). There used to be ornate wooden barges on the river bank here at the southern end of Christ Church Meadow to house rowing facilities and for viewing races. Now the barges are gone and there are boathouses instead a little further down the river near the confluence with the River Cherwell. Poplar Walk in Christ Church Meadow is used as a route to and from the boathouses. The name "Isis" is also used for the men's second rowing crew of Oxford University Boat Club, who race against the men's second crew of the Cambridge University Boat Club, Goldie, before the annual Boat Race on the Thames in London. For a few days I amused myself with Pablo Fanque fishing in the Isis. Pablo was a very expert angler, and would usually catch as many fish as five or six of us within sight of him put together. This suggested a curious device. You must know that Pablo is a coloured man. One of the Oxonians, with more love for angling than skill, thought there must be something captivating in the complexion of Pablo. He resolved to try. One morning, going down to the river an hour or two earlier than usual, we were astonished to find the experimental philosophic angler with his face blacked after the most approved style of the Christy's Minstrels. Thame and Isis, carved by Anne Seymour Damer. The keystones of Henley Bridge depict carved faces intended to represent the Isis and the Thame. Thame is a bearded man, while Isis is female. The Morris Isis name was first used by Morris Motors Limited of Oxford on a six-cylinder car made from 1929 to 1931. It was resurrected on a six-cylinder car from the British Motor Corporation in the 1950s. The name died out in 1958. HMP Isis is a Category C Young Offenders Institution in England operated by Her Majesty's Prisons adjacent to HMP Belmarsh and HMP Thameside near the River Thames in the Woolwich area of South East London. Each of the Formula Student cars manufactured by the Oxford Brookes racing team uses the name ISIS in the beginning of its chassis number. ISIS is then succeeded by the year number; for example, ISIS XII was the 2012 chassis, nicknamed "Miss Piggy". The ISIS neutron source is named after the river Isis. ^ The name is first recorded c. 1350 as Isa, and in its modern form in 1577. ^ a b Mills, David; Room, Adrian (1998). A Dictionary of British Place-Names. Oxford University Press. ^ Wallett, W. F. (1870). Luntley, John (ed.). The Public Life of W.F. Wallett, the Queen's Jester: An Autobiography. London: Bemrose and Sons. p. 73. ^ STFC. "STFC explains the origin of ISIS name". YouTube. STFC's official YT Channel. Retrieved 14 June 2017. This page was last edited on 25 November 2018, at 12:47 (UTC).